Chinese Premier Wen Jiabao vowed thorough investigation and severe punishment to the producers of fake milk powders that killed dozens of babies in East China's Anhui Province. An investigation team was sent to the area by the State Food and Drug Administration Monday. At least eight babies Fuyang, Anhui Province, have died last year by severe deficiency disease caused by fake milk powders. More than 100 other infants in the Fuyang area, mostly between three and five months old, still suffer from malnutrition after drinking various cheap milk powders produced in North China's Inner Mongolia Autonomous Region, Northeast China's Heilongjiang Province and Beijing. Although banned in Fuyang, such inferior milk powders are still sold in some rural areas of the city, China Central Television (CCTV) reported. 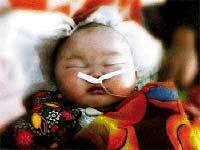 Born healthy, the baby victims became thinner and thinner, but with large heads compared to their bodies. "My girl, the first child of mine, died when she was only four months old after drinking the 'Haobaobei' milk powder," Zhang Linwei, a 32-year-old villager of the Wangzhuang Village in Fuyang was quoted by CCTV as saying. Zhang realized that his daughter got ill after the girl refused to drink the milk powder any more half a month before. "Before that, I thought my daughter's face was becoming fatter and fatter because she was fed well and grew fast,"the baby's father said. When the girl was sent to hospital, physicians had a difficult time finding blood vessels due to a large concentration of water under he skin. The girl died nine days later and all of the family's savings were spent for medical fees. "It is like a nightmare. I never imagined that my baby would pass away like this," he said. Zhang said he tried to contact the producer of the milk powder according to the address on the packing bag but never succeeded. According to statistics provided by the Fuyang Centre for Disease Prevention and Control, 97 per cent of the unqualified milk powders the sick children ate fail to reach the national standard of protein content for infant milk powder - at least 10 per cent. "The fake milk powders only have 5-6 per cent protein and the lowest is has only 1 per cent," Qi Yong, an official with the centre said. "For babies, drinking such fake milk powder is no different from drinking water," Zhang Fangjun, a medical expert with the Fuyang Renmin Hospital said. 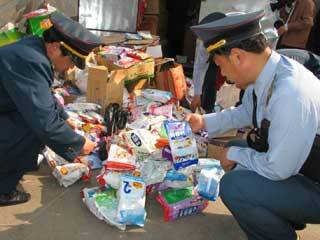 "Such so-called milk powder cannot provide any nutrition for babies' growth," Zhang said.